Enjoy whiskey at our ATL distillery Thurs, Fri & Sat. Walk-ups welcome. No tour reservation required. 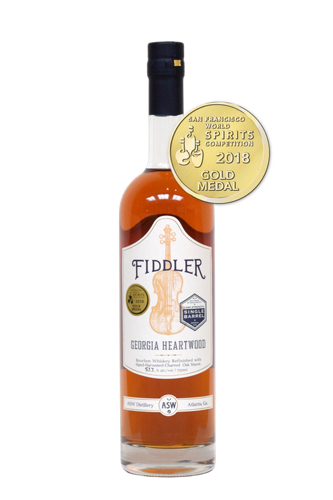 Georgia's 1st-Ever Double Gold Whiskey, Duality is also the world's 1st whiskey to mash, ferment & distill malted rye and malted barley in the same batch. Duality is the crossroads where the fruit, spice & robustness of rye meet the smoke of a Highland-style single malt. Notes of honey, toffee, stone fruit, and a dusting of smoke. A true ode to American Bourbon, perfect for campfires, concerts, and a killer Old Fashioned. We foraged over 2 years for a unique, wheated bourbon, then "fiddled" with it for over a year. The result is a marriage of this wheated bourbon & our house-distilled high-malt bourbon. Notes of toffee, clove & citrus. One of the most unique ryes on the market, a revival of a centuries-old-style made from 100% malted rye (rather than the unmalted rye of most ryes). It's what put us on the map for craft distilling. The result is a smooth, chocolatey rye that sips smooth & complex, while also making a mean Manhattan & a snappy Sazerac. Notes of chocolate, graham cracker & apricot. A smooth and distinctive silver whiskey, perfect as a substitute for vodka in cocktails and for bourbon in the warmer months. Crafted in small batches by ultra-filtering a blend of choice, slightly-aged bourbon and other spirits for a cocktail-friendly expression. Notes of sweet grain, banana & mint. The same foraged high-wheat bourbon base as our flagship Fiddler Unison Bourbon, finished on staves of Georgia oak heartwood that our distilling team harvested and hand-charred. The 45% wheat content is unique for bourbons, leading to a sweet, smooth profile, despite its high proof. Notes of caramel, maple, toffee, clove. 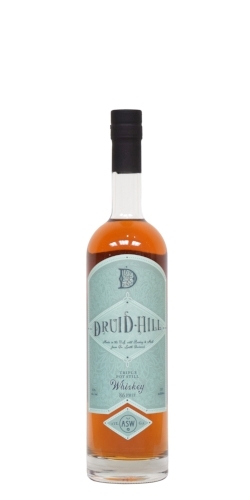 We’ve crafted Druid Hill in the old Irish tradition with 30% unmalted barley and 70% malted barley grown by Loughran Family Malt, a 6th generation family farm in County Louth, Ireland, near Dublin. Triple-distilled on our copper pot stills like the pure pot still whiskies of yore, we then mature Druid Hill in new, charred, white oak casks. Notes of chocolate chip cookie dough, fig preserves, honey. Each batch features different barley varietals, yeast strains & finishing techniques so you can taste the immense flavor differences that slight changes in material can make. Each whiskey in the line differs. A pre-Prohibition-style Apple Brandy crafted entirely from apples provided by North Georgia's Mercier Orchards, rested in white oak casks, and bottled overproof. The result is an apple-forward expression without the sweet or syrupy aftertaste of many mass-produced brandies. Notes of apple crisp, vanilla & cinnamon toast. At 45 ppm phenol content, Tire Fire has the type of peat you find in Islay-style single malts. Distilled from 100% heavily peated malt from Inverness, Scotland, we then mature Tire Fire in new, charred oak. For those who share their breakfast with bears, who hydrate with tankards of seawater, who like all the peat a single dram can hold. Notes of smoke, toffee, caramel, cherry, and vanilla ice cream. A unique take on America's native spirit, we reduced the corn (which can clock in as high as 85% in traditional bourbons) in favor of flavorful smoked malts and distilled this with the grains in. Mashed, distilled, matured, finished & bottled entirely in-house on our traditional, Scottish-style twin copper pot stills.